New Delhi: The Prime Minister,Narendra Modi, on Tuesday held a meeting with top scientific officials of the Government of India. These included Dr. V.K. Saraswat – Member, NITI Aayog; Dr. R. Chidambaram – Principal Scientific Advisor, Government of India; and Secretaries related to scientific departments in the Union Government. Officials briefed the Prime Minister on progress in various areas of scientific research. The Prime Minister asserted that science, technology and innovation are the keys to progress and prosperity of India. He said that the Government’s priority in the science and technology sector is to apply science to solve our country’s problems. Giving the example of talent spotting in sports, the Prime Minister said that mechanisms should be made to identify the brightest and best science talent among school students. He said that a lot of innovation is happening at the grassroots level. Urging officials to break silos, the Prime Minister strongly emphasized that a mechanism should be formed to document and replicate successful innovations at the grassroots level. In this context, he also mentioned innovations being done by defence personnel. In the agriculture sector, the Prime Minister identified high-protein pulses, fortified foods, and value addition in castor, as priority areas which needed to be speeded up. In the energy sector, the Prime Minister said that the possibilities of solar energy should be pursued to the maximum, to reduce dependence on energy imports. 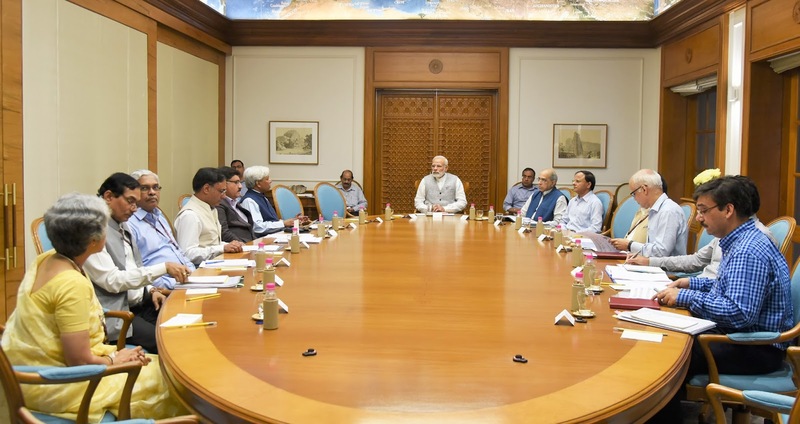 Expressing confidence in the abilities of Indian scientists to rise up to the challenges, and provide solutions to improve the lives of the common man in India, the Prime Minister asked the officials to draw up clear targets to be achieved by 2022, the 75th year of independence.